I just created a new form called Firefighter Key Chains and set the e-mail alert to the correct address but my e mail submissions form that form are not showing up in my inbox or spam either. I have successfully created and use other JotForm forms so I am not sure what is wrong with this one. 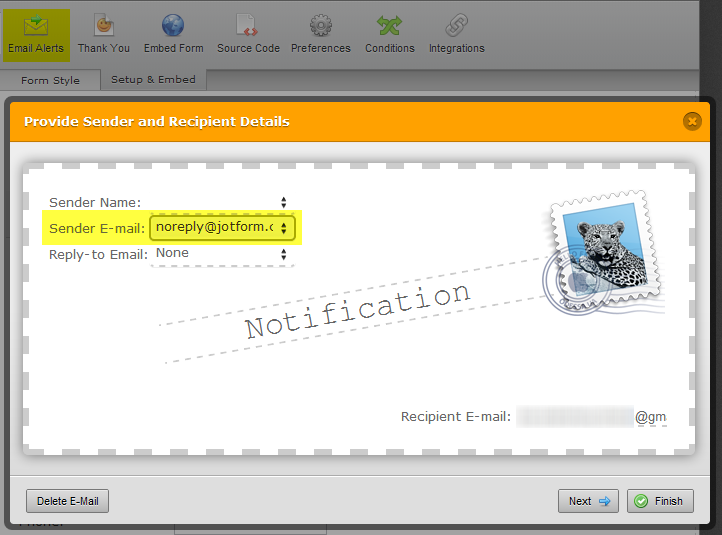 Please open your Email Notification and set the Sender E-mail to noreply@jotform.com. Then, re-check email delivery by submitting the form. 1. Log into your JotForm account and go to My Forms section. 2. Select the form and click on "Edit". 3. Click on "Setup and Embed" tab on the form builder toolbar. 4. Click on "Email Alerts" and select "Notification". 5. Click on "Reply-To and Recipient Settings" button (third from the right along the bottom). If that does not help, please let us know. I see you have paypal payment field in your form. Unfortunately, notification wont send emails if you'll not complete the payment process after redirected to paypal. Failed to complete the payment process will result to Pending Submissions. I'd suggest to remove first the paypal payment field before making a test submission so you'll not get redirected to paypal and then restore it afterwards. Thank you, I was wondering if that was the issue. Were you able to make a test? Please let us know what your results are so we can assist you further. Thanks!